What Does Surprise Jobless Rate Drop Mean For Obama And 2012? : It's All Politics News of a fairly dramatic month-to-month drop in the jobless rate in November, down to 8.6 percent from 9 percent the month before, is guaranteed to trigger a feverish round of speculation as to what it means for the 2012 general election. At first blush, it seems like good news for those Americans getting work and for those hoping to keep their jobs, first and foremost President Obama. What Does Surprise Jobless Rate Drop Mean For Obama And 2012? 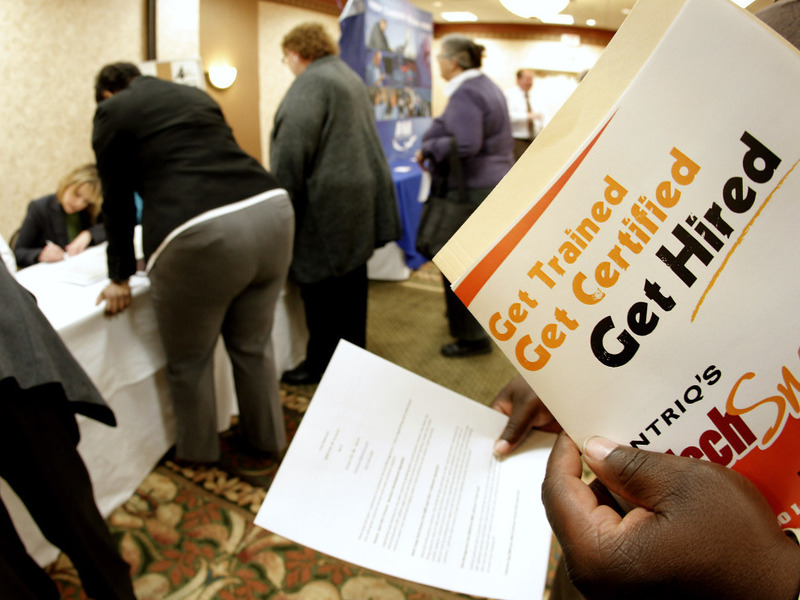 Job seekers attend a career fair in Overland Park, Kan., Dec. 1, 2011. News of a fairly dramatic month-to-month drop in the jobless rate in November, down to 8.6 percent from 9 percent the month before, is guaranteed to trigger a feverish round of speculation as to what it means for the 2012 general election to which this post is an early contribution. It's obviously at first blush seems like good news for those Americans getting work and for those who hope to keep their jobs, first and foremost President Obama. That's especially true since the significant drop in the number most people pay the most attention to, the jobless rate, surprised even the experts who had expected that the rate would remain flat. The jobless rate is now where it was in March 2009, shortly after Obama took office. But as the White House Council of Economic Advisers is always quick to remind us, it's important not to read too much into one month's data. And while the jobless rate fell, about half of that came from discouraged workers giving up their job searches. Of the 120,000 payroll jobs added, while certainly helpful, they were still far less than the 250,000 jobs that would be needed every month to make a serious dent over several years in the jobless population of 15 million. Even so, it wouldn't be surprising if some celebratory fist bumps and high fives were exchanged at the White House Friday morning. If the trend continues, that would clearly be a better backdrop for Obama to argue that his economic policies have worked as much as they could, given the level of Republican opposition he's encountered. It enhances his argument that he has set the right course and that there would be even more improvement if he could get his American Jobs Act passed, which he can't, because of the aforementioned GOP opposition. To the extent that falling jobless rates may improve the overall mood of consumers and employers to spend money and take risks, that could feed on itself, lifting the nation's confidence and boosting Obama's job performance numbers. Of course, if that increased optimism also leads to more unemployed people re-entering the jobless market in the hopes of finding work, that could make the jobless rate rise again. So could an implosion of the Eurozone. So we're not out of the woods by any stretch. For Republican presidential candidates and lawmakers on Capitol Hill, if the trend continues it clearly means they mean need to recalibrate their argument that the Obama administration has been disastrous for the economy. It will be harder to make that case if jobless rates continue to fall, though more difficult isn't the same as impossible. "Any job creation is welcome news, but the jobless rate in this country is still unacceptable. Today marks the 34th consecutive month of unemployment above eight percent. As you may remember, the Obama administration promised unemployment would stay below eight percent if its 'stimulus' was enacted. That promise has gone unfulfilled." Actually, the Obama administration never "promised" the jobless rate would remain below eight percent with the enactment of its 2009 stimulus. Republicans are pulling that from a heavily qualified forecast former Obama economist Christina Roemer made in early January 2009 before Obama even took office. For a full treatment of this issue, read PoltiiFact's examination of the Republican claim which the journalists at the fact-checking website declared to be "mostly false." No matter how many times the falseness of this "fact" keeps being pointed out, somehow it keeps reappearing in Republican talking points.